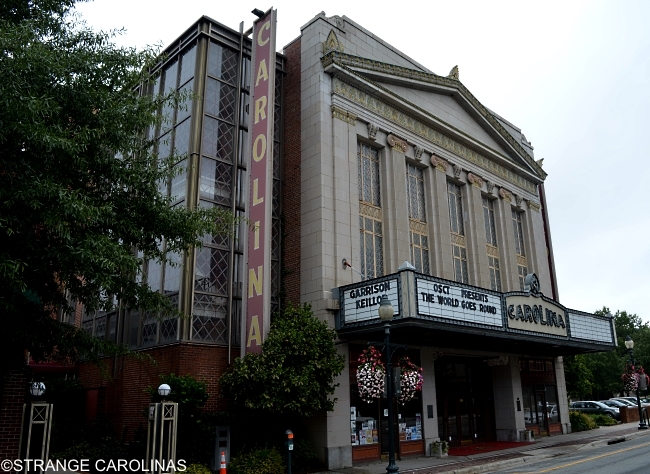 The Carolina Theatre Of Greensboro opened on Halloween night in 1927. 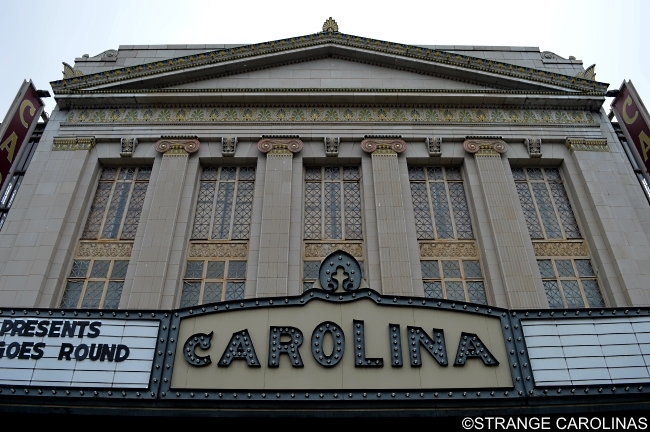 "The Showplace Of The Carolinas," as it was originally called, began life as a vaudeville theater. 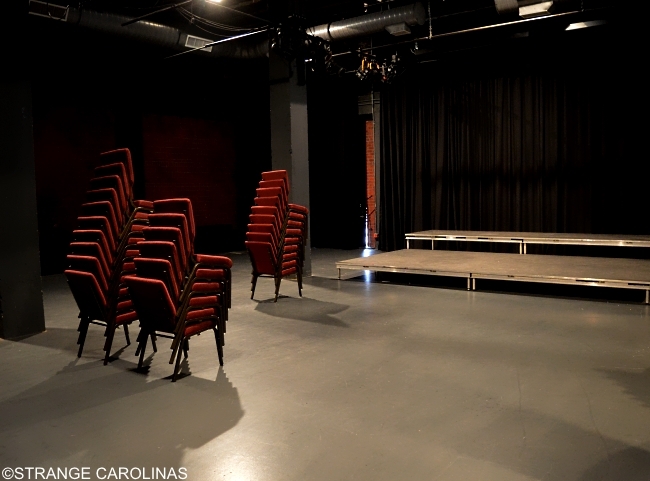 Today, it hosts national music acts, comedians, speakers, authors, film festivals, plays and musicals, and more. And it's also home to three ghosts. 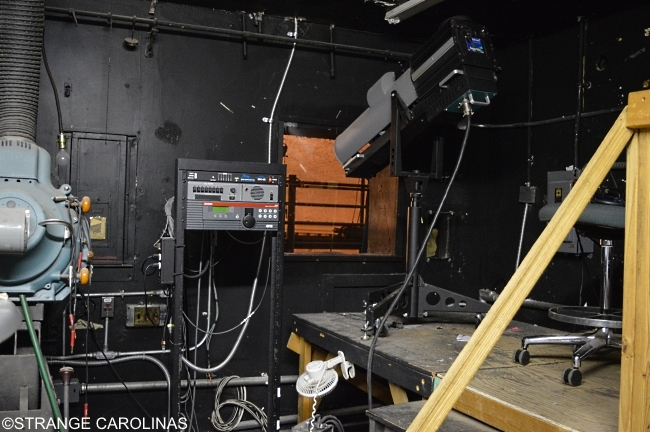 We were given a tour of the facility by Technical Director Brandon Warren, who has been with the Carolina Theatre for eleven years. In addition to being the Technical Director, he's also the resident ghost expert, and has not only encountered the ghosts on numerous occasions, but has actually seen an apparition. He spent the morning with us, telling us stories of his and others' encounters with the ghosts of the Carolina Theatre. "I was coming in one morning, it was bout 7:00 in the morning. 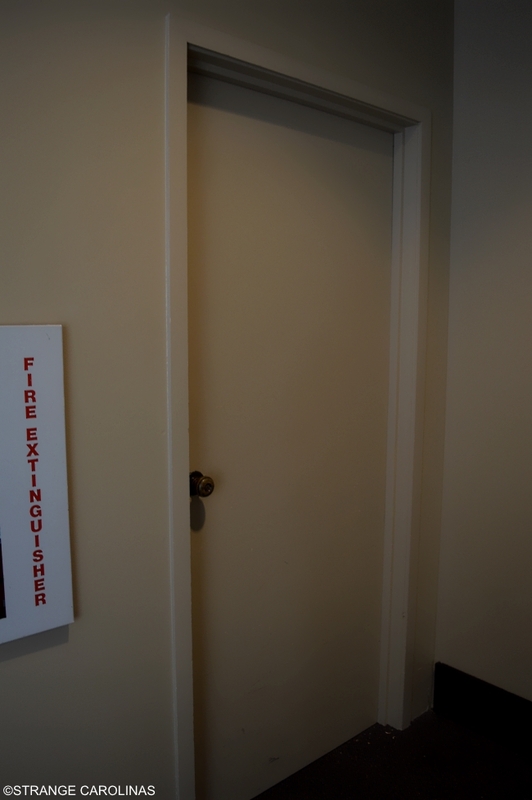 I was coming in right through this door and walked across the lobby. I was still kind of waking up. There was a man in work clothes walking across the lobby, maybe 10-15 feet in front of me. I followed him all the way across the lobby. I thought it was my co-worker. He pushed the door open to the restroom. 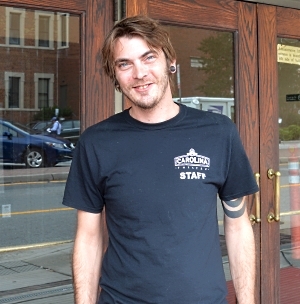 I walked in right behind him, opened the door, and right as I opened the door, my co-worker came from the auditorium. The lights were off in the bathroom and there was nobody in there. It was a full-body apparition that physically opened the door and vanished right in front of me. That was the weirdest thing that's ever happened to me. A steelworker fell from one of the beams when they were constructing the building. I think it was probably him because it looked like he was wearing overalls or Dickies like he was a worker." 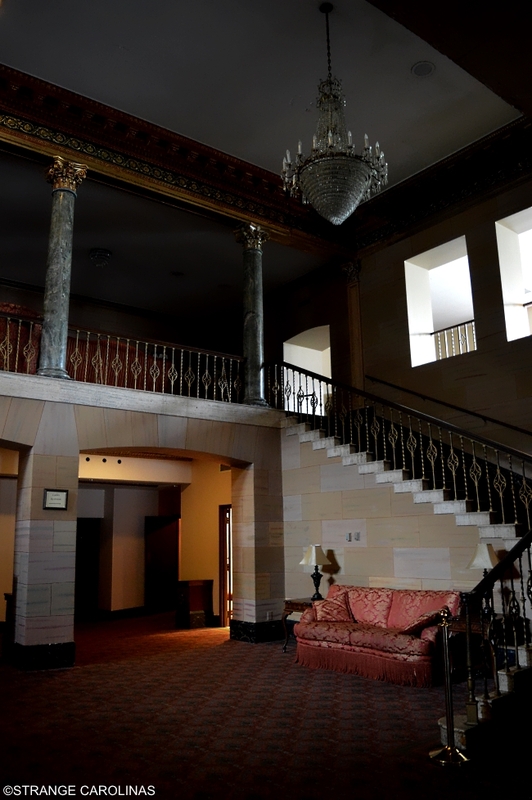 "Back a couple of years ago, there was a ghost hunters team that came in and did a lengthy overnight stay. They reported communicating with a little boy whose house used to be on this property before they built the theater. He apparently passed away in some tragic way. I've never seen the little boy, but there are definitely little childish things that go on around here. I've had stacks of chairs that I've been moving. I'll move one and come back and one chair will be taken off the stack and sitting next to it. One day I was on stage and I just got a weird feeling so I was talking, 'Hey, is this you?' and a bolt came flying across the stage and rolled up and hit me in the foot. And I was the only one here." These are the chairs the little boy likes to play with. "Back in the '80s, there was a homeless woman who apparently had some medical issues. She came to a movie and hid behind the seats. Apparently, she was denied her medicine that day and she told them if she didn't get her medicine that Greensboro was going to burn that night. After the movie, she hid behind the seats and everybody closed up. She went into the south stairwell and started a fire. She passed away in that fire. Her name was Melvalina Ferguson. It was pretty bad. It caused tons of damage to the theater. It took several years to renovate and get back up to shape to reopen. She has been seen in the mezzanine level, walking across and holding a clothes basket. People during rehearsals have seen her walking back and forth and then just disappear." Mezzanine, viewed from the third floor. We took several pictures from the mezzanine, but all came out blurry. "About a month ago, I was upstairs in the third-floor space called the Crown. It's like a blackbox theater. I was up there and I heard this loud blaring country music and I thought somebody had some music playing on Spotify on their phone. We have a kitchen up there. I was walking around and I was like, 'Who's here?' As soon as I got out of the kitchen where the noise was coming from, it went away. I walked all around and I was the only one up there. That was interesting. I guess someone here likes country music." The kitchen where the ghosts listen to country music. "One of our house managers was upstairs. He went to one of our storage closets and the doorknob just started jiggling like crazy. He was like, 'Yeah, I'm not going in there right now.'" The door the ghost was trying to open. "We had a guy who was up in our spotlight booth and he was getting ready for a show. There's this little area that takes you up onto the roof and he said it sounded like someone was throwing cans around. The noise kept going on and on and on." "People have heard their names whispered in their ears. We have a Clear-Com system so we can communicate with everyone throughout the building during a show. One day, a past employee heard his name called out on that speaker system and he couldn't get in touch with us so he called me on the phone and said, 'What do you want, man?' And I'm like, 'What are you talking about?' He said, 'You just called me on the Clear-Com.' And I said, 'It's not even turned on.'" "Years ago, I think it was the Wizard Of Oz, the Community Theater of Greensboro does that year after year. 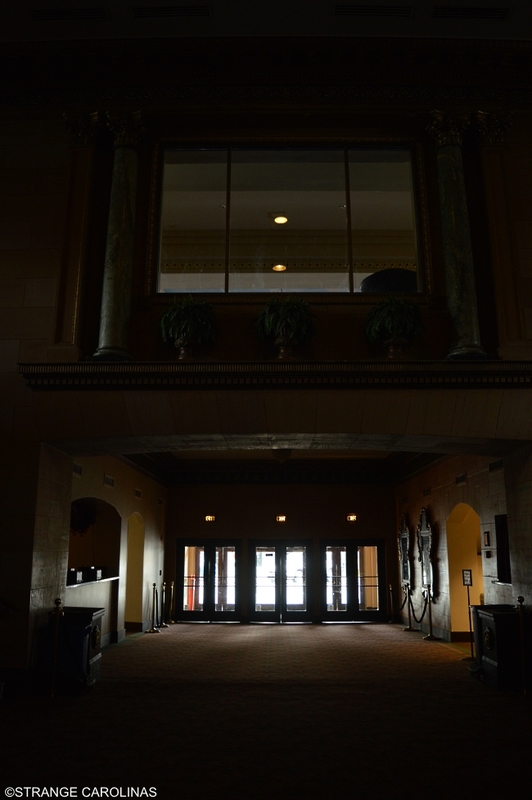 The whole cast said they saw somebody walk across the mezzanine and then just disappear into the north wall. That was a whole cast of people who said they saw that." The only portion of the Carolina Theatre that still shows fire damage. 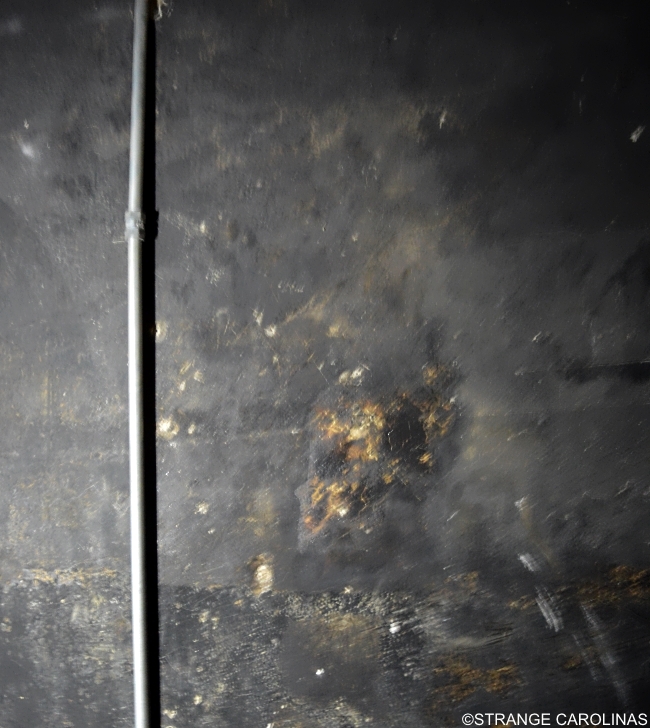 "One night, probably ten years ago, on the north wall, you can see where there used to be a window. It was probably just used for construction, where they hauled stuff in, but it was all bricked up. Somebody was like, 'Hey, look at that lady in the window!' 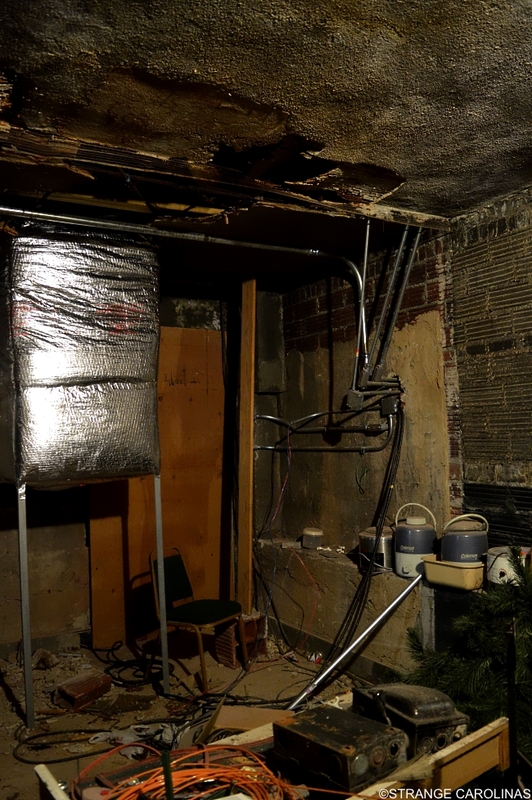 but it was completely bricked up." "Doesn't everyone? I think the little boy, if he passed that young, and this was your stomping grounds, this was your house, and you're fortunate enough to have something this cool be built here, I'd stick around to see a show or two." 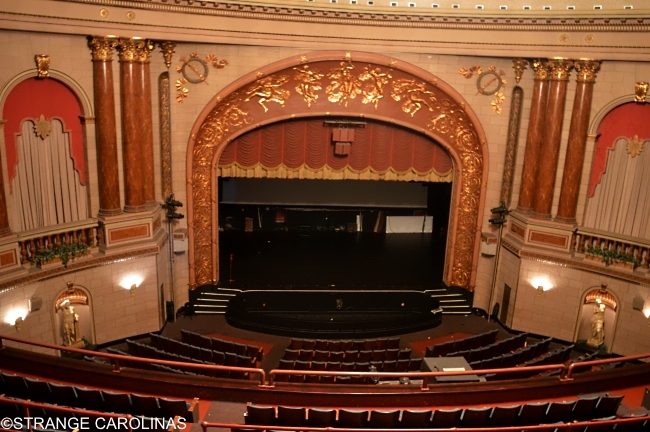 We would like to thank the Carolina Theatre of Greensboro and Brandon Warren for being so welcoming, showing us around the magnificent theater, and sharing so many great ghost stories with us. 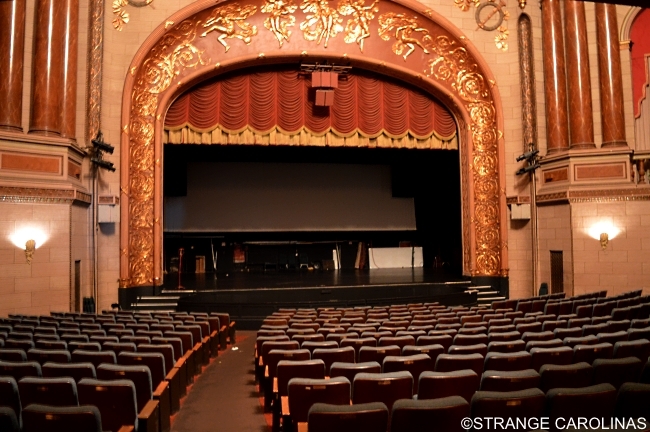 But the theater is so much more than ghost stories. 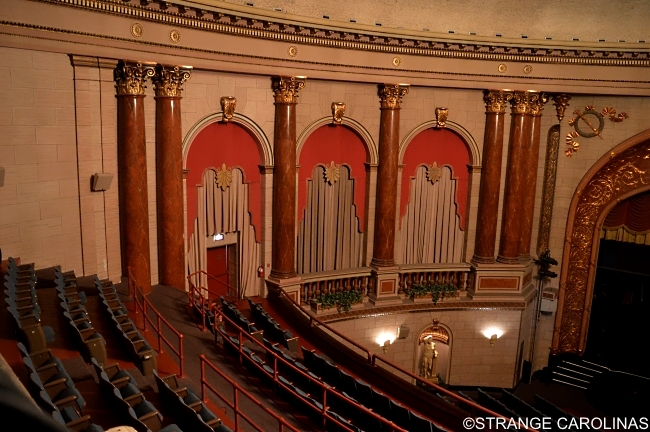 The Carolina Theatre Of Greensboro has an impressive upcoming lineup, including an October 19th date with one of our favorite authors, David Sedaris. You can view the entire schedule here. *Most places online refer to the woman as Melba Frey and Brandon Warren referred to her as Melvalina Ferguson. According to the July 3, 1981 edition of the Greensboro Daily News, the woman's name was Melvaleene Reva Ferguson.